For River Byelaw 9 - Drink or Drugs which remains in force following the introduction of Thames Byelaws 2012 on 1 July 2012 click here. Rules and regulations covering the transport of dangerous substances in the tidal River Thames. 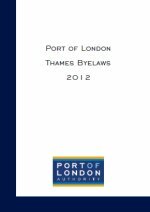 Rules and regulations covering the licensing of certain classes of commercial vessels on the tidal River Thames. Rules and regulations covering navigation on the tidal River Thames. Rules and regulations concerning compulsory pilotage for certain vessels navigating the tidal River Thames. Essential, up-to-date information and advice to those navigating in the port. For general enquiries about Notices, Regulations and Navigational information, please use this Enquiry Form.